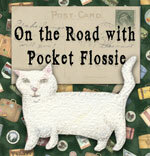 flossie's world: Because I Want To. I'm going to make a run for it. All the way down the alley. No one can stop me. I need to see what the neighbors have been up to. Oh, great, Dog is here. "Flossie, are you supposed to be out here?" "Is she supposed to be out here? I don't think she's supposed to be out here." Dog, leave me alone. I'm busy. I have stuff to sniff. That's all I needed. I'll just run back inside before anyone notices I've been gone.